♥︎ When will my order ship? Normally you can expect your shiny new nail products to ship within 1-2 business days (M-F not including weekends and holidays). However on occasion we are launching new collections that people want to get their hands on! So shipping could take just a tad longer. Don’t worry, we got your back, as soon as your order ships you will receive email confirmation along with a tracking number. ♥︎ Do you ship outside of the United States? How much does shipping cost? Of course we do, fabulous nails are well-traveled. We will ship almost everywhere in the world. Some countries are excluded, require a business or a tax ID to ship to; we will contact you if there are any of these issues with your shipment. Shipping rates vary based on weight and distance; estimated cost will be calculated at check out. PLEASE NOTE: Customers are responsible for all Duties, Taxes and/or VAT (Value Added Tax) or customs fees imposed by their respective countries when shipping internationally. These taxes are NOT included in the International shipping fee and orders will not be refunded because of unwanted additional fees. Please check with your local post office to find out fees before placing an order. ♥︎ Do you ship to P.O. Boxes or APO addresses? FedEx is our shipping partner and unfortunately they cannot deliver to P.O. Boxes. If you are unable to provide any other physical address for us to ship to, give us a call and we will try to make special arrangements for you. Also we are unable to ship to any APO or FPO addresses. We love our service men and women, but due to FedEx restrictions we cannot provide this shipping method. ♥︎ My order shipped, when will it arrive? Our friends at FedEx Ground work pretty quickly. Orders to residents within the USA, once shipped typically arrive in 3-5 business days. Orders outside the USA can take 10-21 business days. Due to the increase in mail theft, all orders over $100 require a signature upon delivery. We know our customers are busy people, so you do have the ability to waive the required signature by calling us. But please note you will in turn accept full responsibility for the package. ♥︎ What payment methods do you take? We currently accept Visa, MasterCard, American Express, Diners Club, Discover, JCB and PayPal. ♥︎ Are Duties, Taxes and/or Value Added Tax included when shipping internationally? Customers are responsible for all Duties, Taxes and/or VAT (Value Added Tax) imposed by their respective countries when shipping internationally. These taxes are NOT included in the International shipping fee. ♥︎ What is your return policy? We cherish all of our customers and pride ourselves on keeping the positive vibes flowing. We will happily replace products damaged during shipping if you contact us know within 15 days of delivery. As a result of safety and cleanliness standards we are unable to offer any refunds, returns or exchanges for any other reasons. We’re pretty sure you will thoroughly enjoy our products anyway. Download and fill out the Merchandise Return form from the link below. Please submit the Merchandise Return form along with the damaged items and a copy of your original invoice. Please allow 2-3 weeks from the return shipped date for your account to be credited. Shipping and handling charges are not refundable. ♥︎ Merchandise Return Form, click here. ♥︎ How can I change my order? 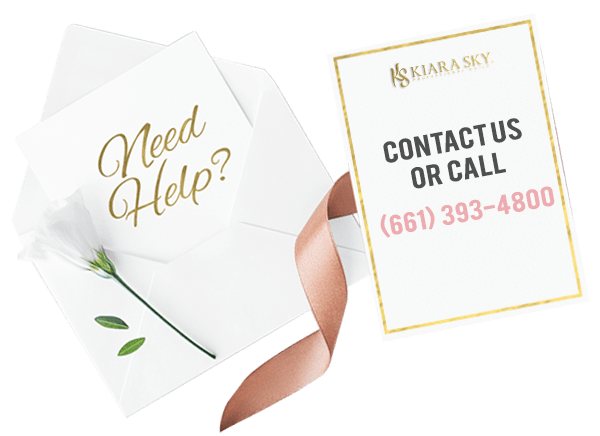 E-mail us at customerservice@kiarasky.com or give us a call at (661)393-4800. ♥︎ Why is the company name Kiara Sky? There is a sentimental meaning behind the company name. Kiara Sky is actually the name of the owner’s three year old daughter. Pretty cool right? ♥︎ Do we carry sample sizes? We are so sure you will love our products that we do not carry sample sizes. However customers are always welcome to purchase individual colors on the Kiara Sky website. You won’t be disappointed. The hard part will be stopping at just one! ♥︎ Do Kiara Sky Gels shrink or bubble up? Of course not! The reason why many nail techs prefer our gel is because it does not shrink or bubble up when applied. We don’t mess around when it comes to quality products. ♥︎ Do the gel polishes for Kiara Sky need a gel polish base coat? Unless they are being used on an acrylic, you do not need a base coat. Just pick a gel polish and go. ♥︎ How does the OMBRÉ (mood changer polish) work? We all get a little moody once in a while, right? Why not make it colorful. The 44 playful shades change color based on your body temperature, your mood, the heat of your coffee cup, or even while you’re holding an ice cold smoothie. ♥︎ What are the most popular OMBRÉ colors? ♥︎ What is a favorite name of one of the products? Easy one, Chinchilla (G410). Have you ever seen a purple Chinchilla? You will when you get this polish. ♥︎ Why did my polish get clumpy even though I closed it correctly? We know, this is like the ultimate tragedy and we are sorry you have had to experience it! Polish is heat and light sensitive, so if it’s exposed to undesirable temperatures there is a possibility that this could happen. If you love our product as much as we do keep it safe from clumping. ♥︎ Is your products cruelty free? Yes, our products are cruelty free. We believe in beauty without cruelty. ♥︎ Is there a catalogue or poster that I can use at my salon? ♥︎ Why are the nails not shiny? It’s very important to follow each step carefully or final result will come out looking more matte than shiny. After a client washes their hands, add another coat of Seal Protect then two layers of Dip Top. It’s very important that the first layer of Dip Top is allowed to completely dry before the second layer. ♥︎ Is this acrylic or a gel? Our dip powders do have a small percentage of acrylates, which is a main ingredient in acrylic powders. However our powders have added vitamins and calcium and are much finer than traditional acrylic. You also uses a series of glazes rather than monomer for application. The reason it’s in such high demand is because you get the acrylic look, but without the damage to the nail or the heavy feel. ♥︎ How many sets can be done from each 1oz bottle of dip powder? There are 10-20 sets, depending on the length of the nail and how much product is being used. That is why you should treat yourself and purchase more than one… just sayin. ♥︎ How do I apply dip powder? You can find our Dip Powder tutorials at How To Do Color Dip Powder and How To Do French Dip Powder , check it out!